1920s extensions on the Peel Street frontage. As one of the few remaining 1850s hotels in Melbourne and one of the earliest surviving buildings in Collingwood, the Grace Darling is of both local and Melbourne-wide significance, providing a striking remnant of the early years of Melbourne's suburban development and an excellent example of an early stone building in Collingwood. 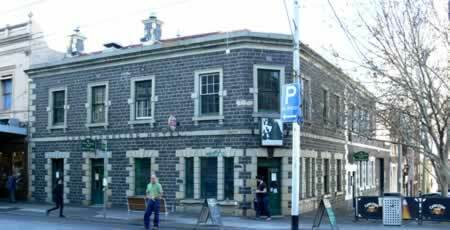 It is also famous as the site of the 1892 meeting associated with the eventual formation of the Collingwood Football Club. Designed by George Wharton, the first owner and publican was Thomas Risby (from Tasmania). The Risby family owned the property until around 1870. Patrick Coyle, owner of the nearby Albion Hotel, was the publican from 1869 to 1879. Built of bluestone, the hotel features Tasmanian sandstone door and window surrounds. Sydney Smith, Ogg and Serpell designed the surprisingly sympathetic 1920s extensions. Its name commemorates the heroine of the wreck of the "Forfarshire" in 1838.